It’s incredible how so many people don’t have an idea about what will happen next on FIFA 18 Ultimate Team. Even many popular FIFA Youtubers and websites don’t know when an event will take place. 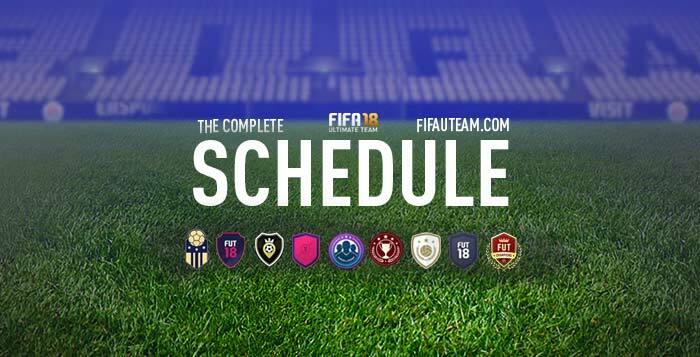 That’s why we decided to create the most complete and accurate FIFA 18 schedule you will find. Find out when will be the next POTM announcement, the FUT Champions monthly reward date, the daily objective refresh or the new featured squad release. It’s time to bookmark this page because we bet you will need to consult it several times. Before starting to look into this FIFA 18 schedule, there are a few things you should know. Is the icons event expiring? Yes, there are no more events on FIFA 18.
have fifa 18 promo packs finished untill fifa 19 is released ? When will players get the last fut champions rewards and what about new squad battles daily refresh times? The last FC rewards will be delivered this Thursday. We still don’t know why Squad Battles refreshing as they are. It says MLS TOTS will be released today (08.08.2018) but they didn’t do that. Do you have any idea about this? We think EA will not release it this year. Who is the Premier League POTM Winner May 2018? Sorry. It looks that it won’t be released. Last year they were released on May 15. We expect to see them again this year but it is not confirmed. Do you know anything about the TOTS SBC? like the time and overall reward..
We have updated it here. TOTS is expected to start at 6pm UK time. You can find TOTS cards in any pack featuring rare gold players cards. Rodrigo, great work as always!, I contacted you years ago & you were very helpful. To do say Larsson SBC, when will say 83/84 cards be lowest?, thanks in advance. You may try during the TOTS. 1) That event is marked as ‘Some Chances’, so it is only an estimated date. 2) Sometimes EA changes the events and the release dates and we can not be responsible for that. For example: the Swap Deals event was originally a FUT United event, according to the EA’s database. All this time, we only did it with two dates: the LaLiga SBC and this TOTKS. In our opinion, we were brilliant doing this calendar. We were right in 99% of the dates. When we fail with these two events, we cannot simply delete them. Otherwise, we would be saying to our followers that these events won’t happen. We have to pick another date and mark that event as ‘some chances’. Do you have any other suggestion about how to do this? It looks a decent suggestion. We are not sure if people will look to the ‘wrong’ date and think that the calendar is outdated but we will analyse and see what we should do about it. A new category looks to be a nice idea too. The opinion of the community is extremely important to us. We would like to hear more opinions about this, before taking a decision. Anyone reading this, feel free to comment please. Do you know when ultimate toty will come out? Ultimate TOTY? What exactly are you asking about? Do you mean POTY? TOTS? what about TOTKS? Do you think that will be released or not at this point? Yes, it will be released. More likely to be on Friday 20. Is it that if you buy a Path to Glory or Ones To Watch player, that the player will be upgraded to his TOTS version when it comes out? TOTS items don’t affect OTW or PTG cards. This calendar is very nice. Thanks for that. But since 9th March you think there’s a new leagues sbc coming with “high chances”. And every week you put it one week behind. Hi. As soon as we read your comment, we realized that we couldn’t be more in agreement with you. That’s why immediately moved the league SBC to April 6, which is the most likely date. We did it Thursday night, so much earlier than the supposed SBC release date. Thank you for your comment. Is it confirmed that the tots event starts april 27? No, it isn’t. It’s only an estimated date. but what do you think is first Premier league or La liga santander? do you know which league sbc’s coming 30th march? First of all, it’s important to notice that it is not guaranteed a new league’s SBC this Friday. Good Schedule…I appreciate the effort. useless schedule, you are saying there was 16 march a new league sbc, well it is now 19 march so it doesnt make sence. First of all, these are estimated dates, and the event you are talking about was not tagged as ‘Confirmed / Extremely Likely’ like most of the other ones. Besides that, EA is free to change their own dates whenever they want and we can not do anything about it. ‘Useless’ is an unfair word for a team that put so much effort into this calendar. More than 95% of the dates were correct, so we are happy with our work, even if you are not. When is premiere league player of the year? They were announced last week. You can know more about it clicking here. We already update the dates.